How close are we to actually having a Ghostbusters Cinematic Universe? Reports vary. 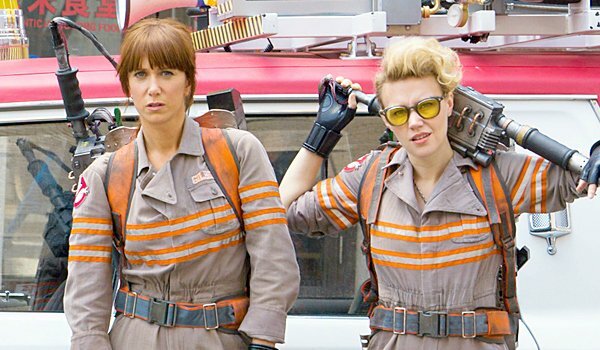 We know, for certain, that we are getting one feature film released in 2016 that will be directed by Paul Feig and star four hysterical women in the lead roles. Beyond that, there have been various statements leading us down mysterious avenues. Here’s the latest. The Wrap cites studio "insiders" in its report that Sony is moving ahead with an animated Ghostbusters feature that will follow on the heels of Feig’s live-action reboot. The trade says that Sony is ready to begin hearing pitches from various writers, and the source even suggests that the story will be told from a ghost’s point of view. Ivan Reitman, the original Ghostbusters director, will produce this animated version. There’s no mention of a possible director in the story. This isn’t the first time we have seen an animated take on the Ghostbusters property. The Real Ghostbusters ran from 1986 to 1991, producing 140 episodes over the course of 7 seasons. It used the classic characters from the two Ghostbusters movies, but avoided the celebrity voices of Bill Murray, Dan Aykroyd, Harold Ramis and Ernie Hudson. Even the caricatures of the characters were different, as the Egon in the cartoon was more surfer-scientist, with a shock of white/yellow hair. In fact, some have made the case that Kate McKinnon is playing a version of the animated Egon in Paul Feig’s movie. I mean, look at her! The idea of an animated Ghostbusters movie matches up with another property owned by Sony. As we reported earlier, Spider-Man will get an animated movie in theaters, developed by Phil Lord and Chris Miller – the mad geniuses behind the rebooted Jump Street series, and the LEGO Movie. It’s hard to tell at the moment how these animated movies will play alongside the live-action versions of both Spider-Man and the Ghostbusters movies that are being discussed. Will they complement them? Tell completely opposing stories? The Wrap says that the Ghostbusters version will NOT be set in New York City, as supernatural activity isn’t limited to Manhattan. That, alone, could help it stand out from all of the other Ghostbusters stories we have seen to date. In addition to Paul Feig’s Ghostbusters and this new animated movie, there’s still the rumor that Channing Tatum and Chris Pratt could get their fingerprints on a Ghostbusters movie in the near future. Needless to say, Sony would like to push weight behind this series and bring it back to life. Will it work?